The model PG23HP-P Bourdon tube pressure gauge has been designed specifically for high-pressure applications up to 6,000 bar. 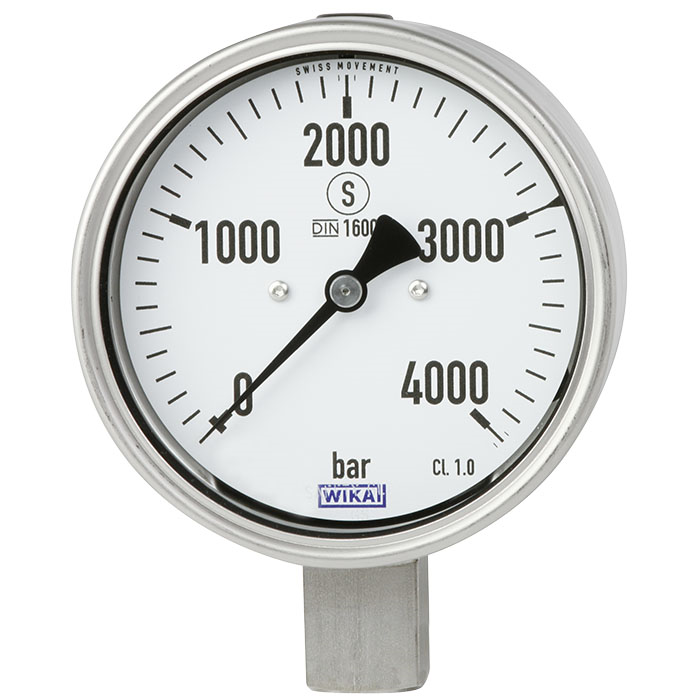 This makes it one of the few pressure gauges available worldwide which can reliably display pressures of this order of magnitude. WIKA manufactures and qualifies the model PG23HP-P in accordance with the requirements of the new DIN 16001 high-pressure standard in the "S3" safety version. The safety version is made up of laminated safety glass, a solid baffle wall between measuring system and dial and a blow-out back. In the event of a failure, the operator is protected at the front side, as media or components can only be ejected via the back of the instrument. Through the use of high-quality stainless-steel and nickel-based alloys, the model PG23HP-P features excellent load cycle stability and long service life. The instrument works reliably within the specification with both static and dynamic pressure profiles. The standard accuracy of the model PG23HP-P is 1.0 %. For scale ranges up to and including 0 ... 4,000 bar, the instrument is optionally available with an improved indication accuracy of 0.6 %.